- the world's favourite kitchen thermometer now has a new look, improved design and additional features. 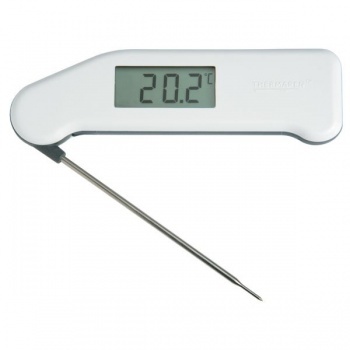 The SuperFast Thermapen thermometer incorporates a large digital display with a precise read-out of temperature over the range of -49.9 to 299.9 °C with a 0.1 °C resolution and an accuracy of ±0.4 °C. The resolution can be switched to 1 °C, if required, via a switch in the battery compartment. As well as being water resistant, it is still 'probably' the fastest reading contact thermometer on the market today. The true temperature of a product can be tested in three seconds. Both low battery (icon) and open circuit indication are displayed, when applicable. Each Thermapen is powered by two lithium coin cell batteries with a minimum life expectancy of 1500 hours.